The Surgical Technology program is co-sponsored by Walters State and Roane State Community Colleges through the Smoky Mountain Health Sciences Consortium. The program includes lecture classes held at the Walters State Sevier County and Roane State Oak Ridge Campuses, delivered both traditionally and via videostreaming, and supervised clinical coursework in an operating room. The program is affiliated with several area hospitals. Each student will be assigned to a variety of clinical sites during the two years of clinical coursework. Clinical experiences may include evening rotations. 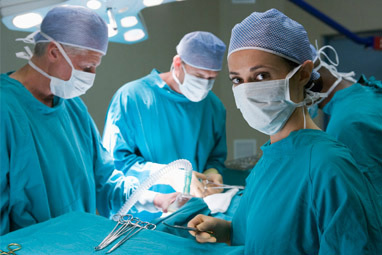 The program will increase the number of surgical technician employees to meet the over 18% increase expected for the 2008-2018 period of time as noted on the Bureau of Labor Statistics 2012 Job Outlook Data. Surgical technology is considered a high skill-high wage allied health profession and data from the State of Tennessee notes a need for 2970 surgical technologists in the state by 2014. The median annual salary for Tennessee surgical technologists is projected in the range of $40,000. The information below is accurate for students who were admitted to the surgical technology program on or before August 2017. The program includes lecture classes held at the Walters State Sevier County Campus and via distance delivery from Roane State Oak Ridge Campus and supervised clinical coursework in an operating room. The program is affiliated with several area hospitals. Each student will be assigned to a variety of clinical sites during the two years of clinical coursework. Clinical experiences may include evening rotations. Lecture classes for the Surgical Technology program are held at the Walters State Community College Sevierville Campus via distance delivery from the Roane State Oak Ridge Campus. Labs are conducted on the Walters State Community College Sevier County Campus.